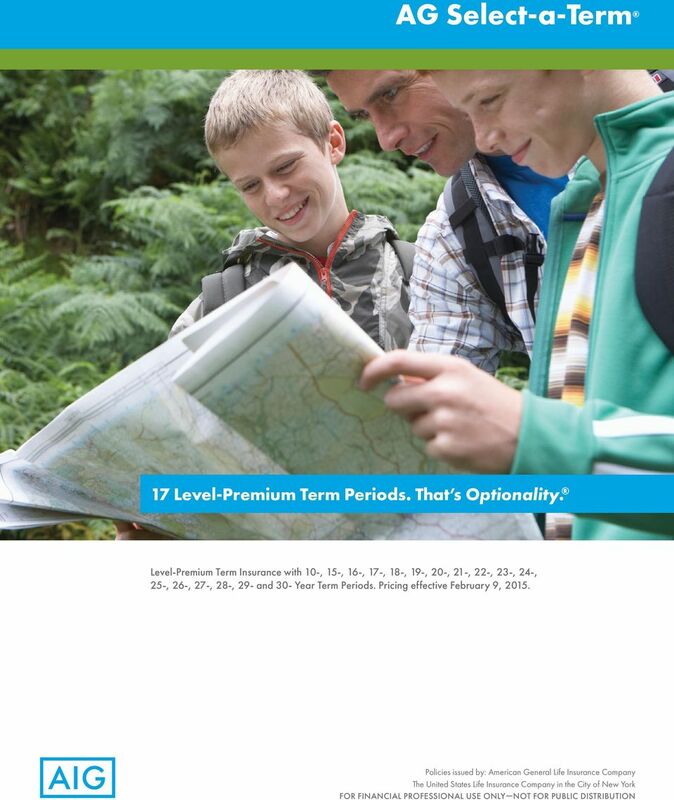 Download "17 Level-Premium Term Periods. That s Optionality." 2 AG Select-a-Term Help your clients get just what they need at the right price One size doesn t always fit all so why should life insurance? With AG Select-a-Term, you can offer your clients competitive and reliable insurance. 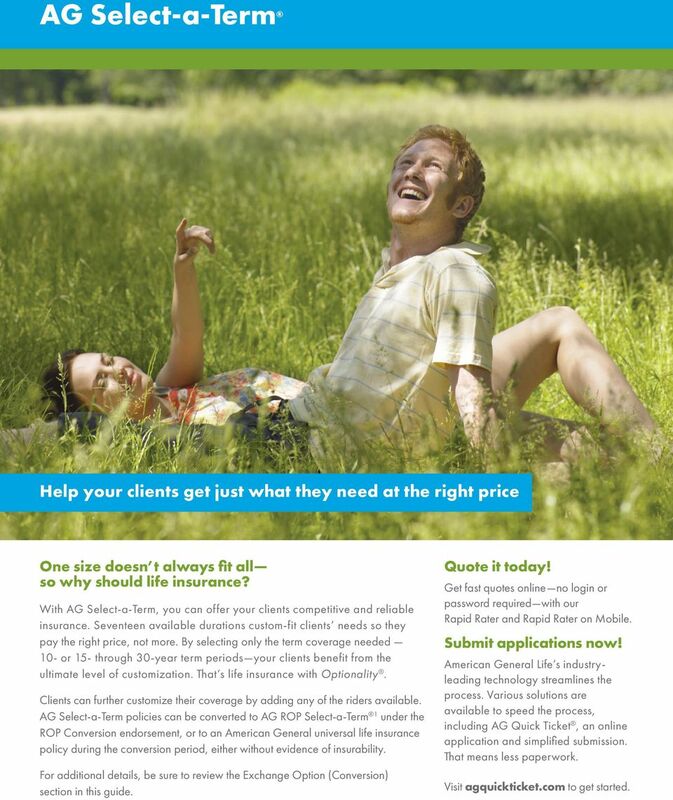 Seventeen available durations custom-fit clients needs so they pay the right price, not more. By selecting only the term coverage needed 10- or 15- through 30-year term periods your clients benefit from the ultimate level of customization. That s life insurance with Optionality. Clients can further customize their coverage by adding any of the riders available. AG Select-a-Term policies can be converted to AG ROP Select-a-Term 1 under the ROP Conversion endorsement, or to an American General universal life insurance policy during the conversion period, either without evidence of insurability. For additional details, be sure to review the Exchange Option (Conversion) section in this guide. Quote it today! Get fast quotes online no login or password required with our Rapid Rater and Rapid Rater on Mobile. Submit applications now! American General Life s industryleading technology streamlines the process. Various solutions are available to speed the process, including AG Quick Ticket, an online application and simplified submission. That means less paperwork. Visit agquickticket.com to get started. 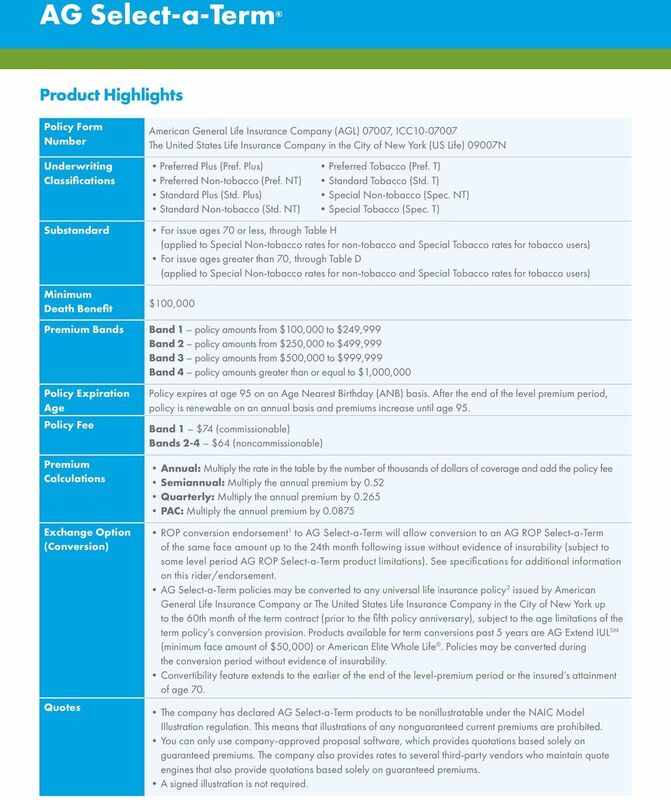 3 AG Select-a-Term Product Highlights Policy Form Number Underwriting Classifications Substandard Minimum Death Benefit American General Life Insurance Company (AGL) 07007, ICC The United States Life Insurance Company in the City of New York (US Life) 09007N Preferred Plus (Pref. Plus) Preferred Tobacco (Pref. T) Preferred Non-tobacco (Pref. NT) Standard Tobacco (Std. T) Standard Plus (Std. Plus) Special Non-tobacco (Spec. NT) Standard Non-tobacco (Std. NT) Special Tobacco (Spec. T) For issue ages 70 or less, through Table H (applied to Special Non-tobacco rates for non-tobacco and Special Tobacco rates for tobacco users) For issue ages greater than 70, through Table D (applied to Special Non-tobacco rates for non-tobacco and Special Tobacco rates for tobacco users) $100,000 Premium Bands Band 1 policy amounts from $100,000 to $249,999 Band 2 policy amounts from $250,000 to $499,999 Band 3 policy amounts from $500,000 to $999,999 Band 4 policy amounts greater than or equal to $1,000,000 Policy Expiration Age Policy Fee Premium Calculations Exchange Option (Conversion) Quotes Policy expires at age 95 on an Age Nearest Birthday (ANB) basis. After the end of the level premium period, policy is renewable on an annual basis and premiums increase until age 95. Band 1 $74 (commissionable) Bands 2-4 $64 (noncommissionable) Annual: Multiply the rate in the table by the number of thousands of dollars of coverage and add the policy fee Semiannual: Multiply the annual premium by 0.52 Quarterly: Multiply the annual premium by PAC: Multiply the annual premium by ROP conversion endorsement 1 to AG Select-a-Term will allow conversion to an AG ROP Select-a-Term of the same face amount up to the 24th month following issue without evidence of insurability (subject to some level period AG ROP Select-a-Term product limitations). See specifications for additional information on this rider/endorsement. AG Select-a-Term policies may be converted to any universal life insurance policy 2 issued by American General Life Insurance Company or The United States Life Insurance Company in the City of New York up to the 60th month of the term contract (prior to the fifth policy anniversary), subject to the age limitations of the term policy s conversion provision. Products available for term conversions past 5 years are AG Extend IUL SM (minimum face amount of $50,000) or American Elite Whole Life. Policies may be converted during the conversion period without evidence of insurability. Convertibility feature extends to the earlier of the end of the level-premium period or the insured s attainment of age 70. The company has declared AG Select-a-Term products to be nonillustratable under the NAIC Model Illustration regulation. This means that illustrations of any nonguaranteed current premiums are prohibited. You can only use company-approved proposal software, which provides quotations based solely on guaranteed premiums. The company also provides rates to several third-party vendors who maintain quote engines that also provide quotations based solely on guaranteed premiums. A signed illustration is not required. 4 Issue Ages 3 We offer fully guaranteed coverage for as long as 30 years at highly competitive rates. The combination of 17 level term durations and expanded issue ages makes AG Select-a-Term a great solution for a wide range of clients and needs including older age clients, term to retirement and term laddering scenarios, and solutions for business owners. Term Period 10 year 15 year 16 year Underwritng Class All States year 18 year year year year year year year year year year year year year Final expiry age is 95. 6 1 AG ROP Select-a-Term is not offered by The United States Life Insurance Company in the City of New York (US Life). 2 An AG Select-a-Term policy may not be converted to a Survivorship or Variable Universal Life policy. 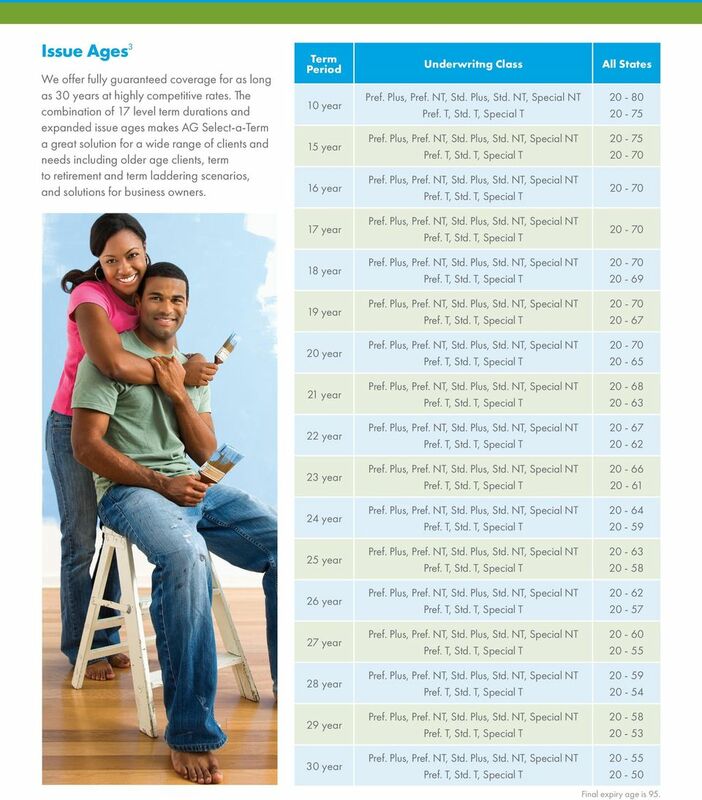 3 Issue age is the age nearest the insured s birthday. 4 See the riders for complete details. There may be a charge for each rider selected. Adding or deleting riders and increasing or decreasing coverage under existing riders can have tax consequences. Policy owners should consult a qualified tax advisor. 5 Not offered by The United States Life Insurance Company in the City of New York (US Life). Policies issued by American General Life Insurance Company (AGL), Policy Form Numbers 07007, ICC , MWL 02AG, 10001, 12436, ICC ; Rider Form Numbers, 79002, 79410, 06305, 91401, 79001, 08818; Term Conversion Option Endorsement AGLC103527, except in New York, where issued by The United States Life Insurance Company in the City of New York (US Life), Policy Form Numbers 09007N, 10001N, 06006N, 12436N; Rider Form Numbers ADB 79-1E, CI 79-1E, WP 79-1E, 08818N; Term Conversion Endorsement AGLC103527N. 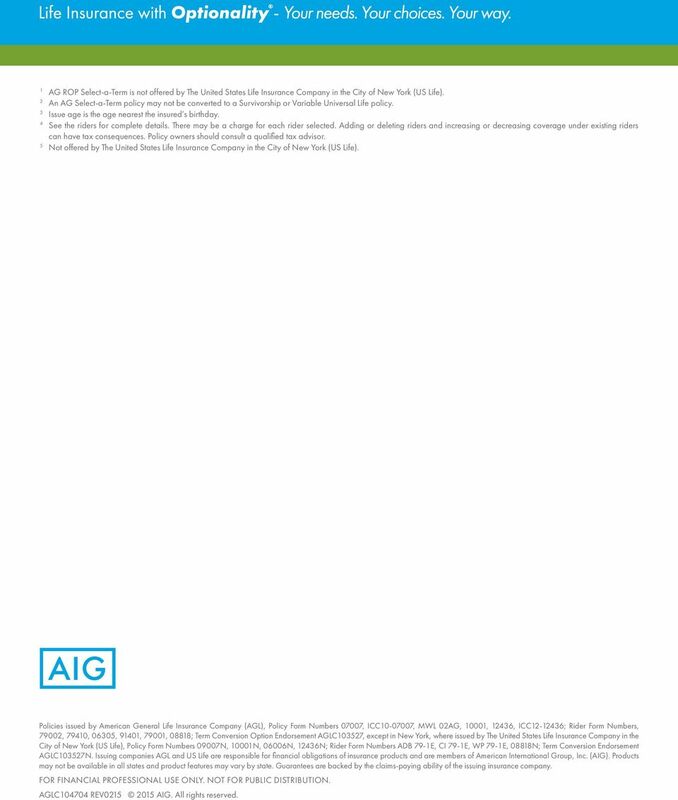 Issuing companies AGL and US Life are responsible for financial obligations of insurance products and are members of American International Group, Inc. (AIG). Products may not be available in all states and product features may vary by state. Guarantees are backed by the claims-paying ability of the issuing insurance company. FOR FINANCIAL PROFESSIONAL USE ONLY. NOT FOR PUBLIC DISTRIBUTION. AGLC REV AIG. All rights reserved. 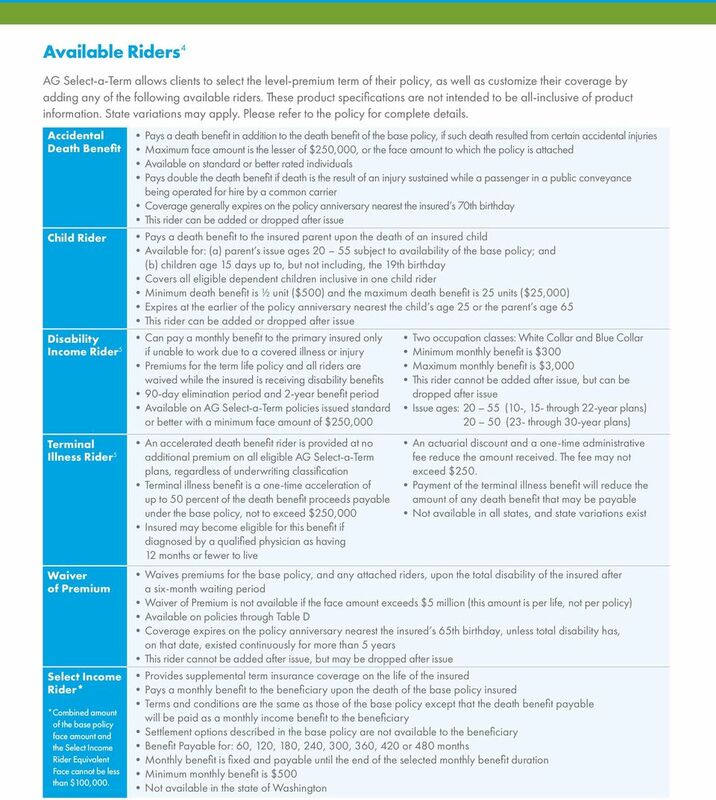 AG Select-a-Term CONSUMER Guide Level-Premium Term Insurance with 10-, 15-, 16-, 17-, 18-, 19-, 20-, 21-, 22-, 23-, 24-, 25-, 26-, 27-, 28-, 29- and 30- Year Term Periods Pricing effective March 17, 2014. KANSAS CITY LIFE INSURANCE COMPANY Cashback Life Return of Premium Life Insurance Like most smart consumers you know life insurance is one of the best ways to ensure your family s dreams are protected. Protection Solutions. Your guide to. Whole Life insurance. with Standard Life. Making Retirement Better. Grow. Protect. Live. Transfer. PRODUCT OVERVIEW 1 Agenda I. Management Introduction II. Genesis Life Product Features III. COF Basic Value Life Product Features IV. Transition to Genesis Life V. Illustration Software VI. LifePRO VII.